1. Ducks reach full size in about 5 weeks. They are cute and fluffy for 2 weeks and then they grow up. Ducks can live 10-20+ years, depending on the breed. 2. Ducks poop everywhere. You cannot train them. 3. You cannot raise a duck and “release it to the wild.” Mallards are wild ducks. 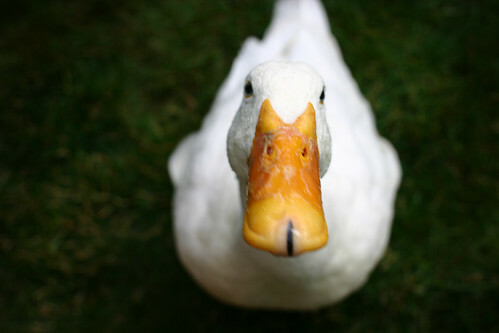 Most other ducks were domesticated by humans. That means they no longer have wild instincts, can’t migrate and are usually too fat to fly. It is illegal to own wild ducks without a permit and illegal to release domestic ducks on public land. In some areas it is considered abandonment and can result in cruelty charges. It’s also a death sentence, as ducks raised by humans can’t fend for themselves in the wild. Did you know bread is bad for ducks? It lacks the basic nutrients they need to grow and thrive. 4. Qualified avian veterinarians to treat your special pet are few and far between. You can find a vet who treats parakeets, but not one who will treat your duck. If you do find one, expect to spend about $80-$120 for a basic duck check-up. 5. There is a reason for the saying “sitting duck.” Ducks need predator-proof pens with hardware cloth on all sides, top and bottom. They must be in these secure pens from dusk to sunrise in some areas, and at all times in other areas. Good pens that you build yourself start at around $300. Your home is not an exception because you haven’t seen a predator or you live on a pond. Raccoons reach through chicken-wire and climb over chain link with ease. Eagles and hawks don’t need to carry off your duck, they just grab a piece. 6. You won’t be able to take a vacation for the next 10-20+ years because there is no such thing as a duck sitter. You will realize this too late, when your vacation is already planned. Ducks require complicated care. Note: None of your friends or family wants to watch your duck while you are on vacation. They asked me to tell you that. 7. Ducks are more maintenance than the space shuttle. Bob Tarte wrote that line in his book, “Enslaved by Ducks.” Believe him. Don’t get a duck. Just read his book instead. 8. Ducks are extremely emotional. More emotional than cats or dogs. If you raise one duck and that duck depends on you, you cannot leave that duck alone for even one day without that duck missing you and getting upset/depressed/scared when you are gone. Don’t do that to a duck. Ducks need duck friends. 9. Ducks are time-consuming. They need twice-daily care, for at least 1/2 hour each time, every day of the year, rain or shine. They won’t thrive unless they get much more of your time than that. But that is the bare minimum amount of time required twice a day, every single day, without fail. 10. Ducks don’t believe you should have hobbies. Want to meet friends for dinner? Have to put your ducks away before dusk first. Want to have brunch on a Saturday? Need to clean the duck ponds first. Like to knit, sew, paint, listen to music, see movies, watch TV, play games, ride a bike? Forget it. Your sole hobby if you have a duck… is your duck. End of hobbies. 11. Do you live with your parents? Absolutely do not get a duck. You think you’ll keep the duck forever, but you will grow up and get interested in your friends or go to college. And you cannot keep a duck in your dorm room. Your parents absolutely do not want to care for your duck while you’re on a date or away at school. Your parents will tell you your duck died and give it away. Seriously. They told me to tell you that. Do not get a duck until you own your own home, can pay vet bills on your own, and can afford food and amenities for your duck. 12. Do you rent your home or live in an apartment? Every year thousands of people get ducks only to give them up because their landlord/girlfriend/boyfriend/parents/neighbors complained. Giving up a duck means that duck will probably be euthanized or suffer. Do not get a duck first and THEN research whether or not you’re allowed to have a duck. Some ducks are extremely loud. Too loud for neighbors. Way, way too loud. Trust me on this. 13. Have a dog? Think he’s old and friendly and wouldn’t hurt a fly? You’re wrong. Your duck will spaz out and flap in a way that will engage your dog’s innate prey instinct. Your dog will pick up your duck and shake it to death while you watch in horror. Yes. Your sweet little dog will do that. Your dog is not an exception. And it will be your fault, not your dog’s fault. Your dog is just being a dog. Do not get a duck if you have a dog. Your duck will taunt your dog. Your duck will chase and bite and taunt your dog until your dog bites it. That will also be your fault. Your duck is just being a duck. 14. Your duck is social and needs duck friends. Your duck does not want to live with just you. Your duck needs other ducks and more ducks means more poop. (See #2). 15. Every duck is a unique individual. Ducks are particular, and don’t automatically get along with other ducks. Two male ducks can kill each other. Too many male ducks can kill a female duck. Larger ducks will pick on smaller ducks and stronger ducks will try to kill weaker or injured ducks. Ducks act like dinosaurs much of the time. Cranky, cranky dinosaurs. 16. Ducks bite. Some male ducks bite all the time. They do not bite because they are mean. They bite because they love you. They bite hard. They bruise. They constantly bite your ankles, hands, arms, feet and face. You must wear long sleeves and long pants and socks and shoes to visit your ducks. 100 degrees outside? Make sure you’re wearing long pants and long sleeves to visit your ducks. Muscovy ducks have a ridge to their beak that can tear your skin off. Muscovy drakes often also protect their territory or decide you are a threat. Then they attack you. They fly at you and beat their 6-foot wing span wings at you, bruising and welting you. Their talons can be 1 1/2″ long and they will try to claw at you in mid-air. They bite and tear at you and chase you down, faster than you can run away. 17. Ducks make a huge mess when they eat. Duck food attracts rats and mice. In some areas, mice attract snakes. LOTS of snakes. Duck poop attracts flies. Having a pet duck means having rats and flies. It’s a package deal. Your neighbors will love that. Think you can kill the rats? Poison them and they will die in your duck pond, poisoning the pond your ducks drink from. Or their carcasses will attract predators. Try to trap and release them instead. Come winter time you can find them conveniently living in the roof of your house, or in your basement, for warmth. 19. Horrible duck stories will give you nightmares. Only you’ll dream that your own duck is suffering or in danger or being eaten or maimed. You will have this nightmare a lot. 20. You will worry about your duck every day that you have it. Lastly, if you’ve made it to the bottom of this list and you STILL think you’re the awesome saintly exception who is going to provide a super safe, loving home to a flock… please think of adopting or rescuing instead of hatching or buying. There are a ton of homeless ducks in need of great forever homes.